A "lifelong" Christmas tree has disappeared from its town centre site, leaving in its place only cones and pallets. 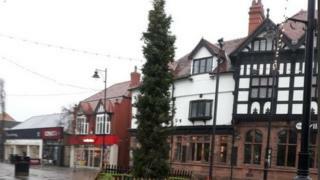 Some residents in Crosby had criticised the town's skinny tree after the lights switch-on last year, but were told it would remain in place, getting bigger each year. However, the tree has since been moved. Sefton Council said a new tree would be planted in Crosby once a permanent site had been selected. Victoria ward councillor Michael Roche explained in December the reason the tree was small was that it was a living tree, which would be in the village for generations. He said schools and other organisations had hoped to decorate the tree for Easter, Remembrance Sunday and the Chinese New Year. "Although there was a lot of negativity posted on social media, when people have realised the intention and that it is a living tree, then responses have been very, very positive. "One said next year they'll be moaning that it is too big." Now some want to know why the tree has vanished. Matt Andrews said: "It's a bit silly isn't it? "I just don't understand why a 'lifelong' tree has been moved already." A spokesman for Sefton Council said: "A new living tree will be planted within Crosby village in the near future once a permanent location is agreed upon by various parties." A council tweet said the tree has been moved to South Park in Bootle.